is our FREE mp3 download for this month. It will be available to download for free HERE until the June 20th. After June 20th, you can download it here at it's usual price of $3.50. 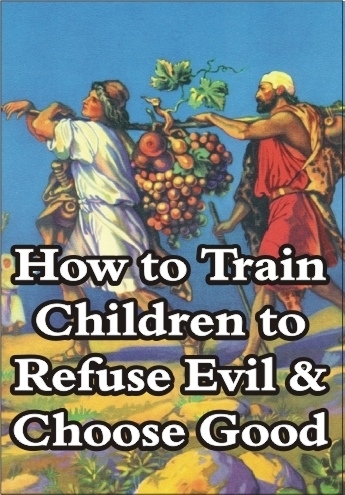 What if it were truly possible to train a child to refuse evil and choose good? What more important thing could a parent do for his child?! Is such a thing even possible? Yes! How? By culturing simple appetites for the ‘best of the best’ in one’s child. The prevailing philosophy of our day that says we should expose a child to lots of good AND evil and let him choose is wrong! Such a child will, most likely, choose evil. The land of Canaan was a “land flowing with milk and honey.” A “butter and honey” diet would be a diet even better than “milk and honey.” This message explains and illustrates the “butter and honey diet” parents need to feed their children to train them to refuse evil and choose good. It also teaches how to decrease wrong appetites and increase right appetites. *For Downloading our Free MP3 Files - Click the title, image or link to listen to the message in your browser or to download it to your computer simply right click (Mac users: Ctrl click) on of the links and select "Save Link As" or "Save Target As" depending on your web browser. Please Sign Up for our Newsletter to be Notified for the next Limited Time Offer!